Version 1.3.3 of DynPEQ fixes several software issues and adds new features. The big feature in 1.3.3 is support for the new 7.0.2 and 7.1.2 channel stem formats in Pro Tools version 12.8. At this time, DynPEQ can support the new stems in Native processing only. We are investigating the possibility of supporting them in DSP processing. For Audio Unit users, the DynPEQ plugin legacy support now goes back to Mac OS X 10.6. The band toolchest has been tweaked. There are now bandsets for Red Book deemphasis. In the course of Red Book testing, we found and corrected problems with the RIAA curve decoding bandsets. If you are a user of 1.3.2 or lower and would like to audition the revised bandsets, please contact support for help in doing so. The DynPEQ plugins now have expanded factory presets. They also have better performance due to the problem reports you have been sending us. Thanks so much for your help. Version 1.3.3 is a free update for holders of a 1.3 license (with license strings QuartetDynPEQv2 or TrioDynPEQv2). To get the update distribution, either contact your reseller or drop us a line for Quartet or Trio upgrade instructions. The big feature in 1.3.2 is support for Pro Tools In-App Installation. The DynPEQ plugins can be obtained, installed, and activated while Pro Tools is running via the Avid App Store, accessible through the Pro Tools menu. The window state of all plugin instances (such as segment open/close, coarse display scaling, and background brightness) are no longer saved when they are released via project close. With more and more instances being used in projects, this wound up causing adverse reactions with some workstations. Instead, you can now save your default configuration of the plugin window by clicking on the plugin title (Quartet or Trio DynPEQ) in the upper-right of the window. There are a few remaining issues with some workstations that we hope to be resolved soon. We found and corrected some minor issues with the quality of dynamic modulation and with adjusting the input and output gain. Lastly, we fixed the performance issues you have been sending in. The big feature in 1.3.1 is support for the Avid Application Manager, which tracks the version of your Avid applications and registered plugins. 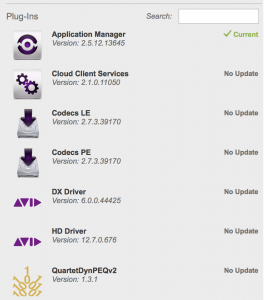 The Avid Application Manager will notify you when all components it can track have new versions available. You can then download the new version with one click. We found and fixed a case in the plugin bypass operation that occasionally caused a audio click, along with other small anomalies. The big change in 1.3 is adding support for Pro Tools AAX/HDX, 32-bit and 64-bit. DynPEQ now supports Pro Tools Native and DSP version 10 and higher on Mac OS X 10.6 and higher. The Audio Unit version 1.3 adds support for the new MacOS processing environment features, namely Gatekeeper, sandboxing, and 64-bit compatibility on Mac OS X 10.7 and higher. The plugin UI window has received a few tweaks for version 1.3. The bands of the fine parameter control sections are now visually tied to their respective coarse controls. We have noted that our user community use the compression curve far more than expansion, so the compression fine controls now have their own self-contained section in the fine controls. We also found and fixed several small inconsistencies in the UI behavior, so we hope you will be pleased with the results. We found and fixed a special case in the input DC block filter that used to cause a click. The default band toolchest now contains bandsets that approximate the RIAA curve filter. The bandsets are tuned to specific sample rates and model the filter to a +/- 0.1 dB accuracy from 20Hz to 20kHz. Since the mastering bandsets drawer in the toolchest now contains many legacy processor approximations, they have been placed into their own drawers among the bandsets. In response to a user suggestion, the Quartet patch store has undergone a makeover. The patch store no longer starts out with no contents at all. On starting a new instance of Quartet, the patch store will contain 127 neutral entries, and you can save into the contents of any of them. The old delete register operation now will replace the register with neutral contents. This allows you to incrementally build a series of patches and better organize your work. The Pro Tools version of Quartet 1.3 has an extra automated parameter that is not connected with fine tuning of the plugin. The automated parameter is called Patch Index, and it allows for rapid switching between entries in the patch store. During automation recording on Patch Index, the clicks you make on numbered square patch recall buttons will be saved and replicated during playback. Lastly, the Audio Unit version of Quartet 1.3 has a companion plugin that works with stereo input and output in dual-mono mode, in the same manner that Pro Tools supports multi-mono plugin instances. The two channels have their own sets of tuning parameters. The special plugin can also work on a mono/stereo mix of the input instead of left/right. The mono/stereo mode allows for adjustable mixing width back to the left/right output.